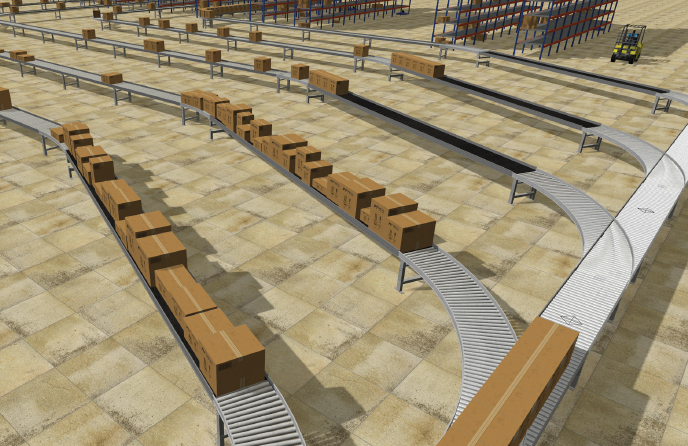 The FlexSim Conveyor Simulatie Software module is een krachtige gratis FlexSim add-on, speciaal gecreëerd voor het simuleren, visualiseren, analysen en optimaliseren van conveyor material handling systemen. de module combineert de benodigde details voor automatisering modellen met een zeer gebruiksvriendelijke interface. Snel ‘slugs’ logica opbouwen zonder een regel te coderen of power en free systemen modelleren inclusief realistische picking operaties en veel meer. The FlexSim Conveyor Simulatie Software module is a superieur alternatief voor andere material handling simulatie software. Onervaren model bouwers kunnen simpel realistische geautomatiseerde picking systemen modelleren. Met de conveyor simulatie software module is het mogelijk om zonder te programmeren zeer complexe systemen af te beelden en te optimaliseren. Hulp nodig bij een Material Handling project? Talumis heeft veel ervaring met het ontwerpen en optimaliseren van material handling systemen en het verbeteren van controle logica. Mocht u hulp nodig hebben bij het ontwerpen of verbeteren van een automatisering systeem bel of mail ons of bekijk referenties in onze cases sectie. Download the FlexSim evaluatie versie. Vergeet niet de Conveyor Simulatie Software module te downloaden inde FlexSim on-line content. Showing cases being picked from a rack and placed on a belt conveyor requires time, effort, and a load of pick up and drop off points. Most modelers save time by having cases placed at the end of a belt conveyor in a picking area and then transported to a merge. FlexSim Conveyor Simulation Software is the only software module in the industry to provide this capability as a standard function. Operators can now pick up cases from a range of possible pick up points in a rack and drop off cases at a range of possible drop off points along the conveyor, rather than a single fixed point. It all makes for easy simulation of picking operations. FlexSim has developed a slug build and release process that requires no computer code to model a sawtooth merge. In fact, it also requires no photoeyes and fewer stations than other popular simulation packages. View our process below to see how FlexSim has taken the tedium out of modeling complex conveyor systems.